Mr. Vallentine leads The Dow Chemical Company Foundation. Previously, he served as director of STEM Education for North America. He also managed a team that was responsible for public affairs strategies and programs at The Dow Chemical Company’s 60 sites in North America, and served as Public Affairs director for Michigan Operations, responsible for strategic site communications, and media and community relations. Ms. Paukert directs site communications and community relations for BASF Corporation in North America. Her responsibilities, and the team she leads, span stakeholder relations across BASF’s manufacturing platform of approximately 100 facilities in the region. This includes media relations; public relations / community relations; science education programming; and incident response / crisis communications. She also oversees BASF’s charitable giving in the region as the secretary of the BASF Foundation USA. Mr. Byer joined NACD in January 2014. As President, he works closely with the Board members and oversees the execution of their directives. He is involved in strategic planning and guiding the Association towards the goals established by its members. Mr. Brown became the President of Brown Chemical Co., Inc. in 1986 and has worked in the chemical industry for over 35 years. Additionally, He has been an active member of the National Association of Chemical Distributors for over 20 years, where he has held various leadership roles. In 2012, Mr. Brown received the Lifetime Achievement Award from NACD. Mr. Corcoran has been with Brenntag North America organization since 2003, where he has held many positions, including President of Brenntag Southwest, headquartered in Lancaster, TX. In 2013, Mr. Corcoran joined the North American Executive Council, and leads the strategic sourcing, focused industry and DEF business. In 2016, he was asked to assume a global role for the Brenntag Group, reporting to the CEO, and work closely with the four regional Chief Executives and other line management functions to coordinate the implementation of initiatives and provide Board level expertise in the areas of commercial excellence and efficiency. 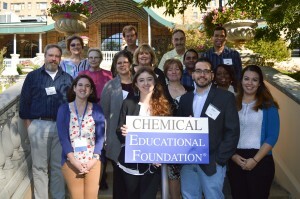 education with CEF, by volunteering with You Be The Chemist local, state, and national Challenges, and by expanding the Essential Elements program in Texas. Dr. Emanuel earned his Ph.D. in Physical Organic Chemistry in 1999. Mr. Fidler joined Brenntag North America in August 1998 as the Executive Vice-President and served as President from 2006-2013. As a Member of the Management Board for Brenntag AG from 2013-2015, Mr. Fidler was responsible for Brenntag’s North and Latin American operations. He began his career as a Purchasing Agent at Kerr Glass Company and then held several positions at Textile Chemical Co. Mr. Fidler previously served as a member of the NACD Board of Directors and past Chairperson for Leadership Giving of the United Way of Henderson. Mr. Hettinga joined Superior as a Sales Representative for Northern Indiana in 1996. Since then, he has held positions as G.M. of Ohio, Regional Sales Manager, and VP of Sales. He currently serves as President of this 100% employee-owned regional chemical products and services provider. Mr. Hill began his career with Univar in 1985 and held a variety of sales and management positions during his tenure with the company, including President of Univar USA and Executive Vice President – Industry Relations. He founded Apex Distribution Consulting and served as its President before becoming CEO of Maroon Group. Mr. Hill is a member of the American Chemical Society. Mr. Jukes joined Univar in 2002 and has served as Executive Vice President and President of Univar USA since June 2016, and President of Latin America (LATAM) since September 2015. From 2011 to 2016, Mr. Jukes served as President of Univar EMEA. From July 2009 to January 2011 he served as Vice President, Sales and Marketing EMEA, and from April 2004 to June 2009 as Regional Director of Univar UK, Ireland, the Nordics and Distrupol. Prior to joining Univar, Mr. Jukes was Senior Vice President of Global Sales, Marketing and Industry Relations, for Omnexus, a plastics industry consortium e-commerce platform and Vice President Business Development for Ellis & Everard Plc. Mr. Jukes is a graduate of the London Business School. As a faculty member of the Industrial Distribution Program, Dr. Lawrence is involved in graduate, undergraduate, and professional continuing education teaching activities, funded research projects, publications and industry presentations. His teaching activities surround classes in manufacturer/distributor relationships, Supply Chain Management, distributor profitability, and distribution strategy. Dr. Lawrence is a fellow of the National Association of Wholesaler Distributors (NAW) institute and the author of five books on distributor competitiveness. Dr. Lawrence holds a Ph.D. in Information and Operations Management from Texas A&M University, an M.B.A. from Texas State University and a B.B.A. in Finance from University of Texas at Austin. He brought over 10 years of industry experience in sales and retail business with him upon joining Texas A&M. Mr. McLaughlin started his career as an Analytical Chemist with Monsanto in 1992. He has held several positions within ICL including technical support, product management and sales. Mr. McLaughlin has a BS in Biology from Augusta State University. Meredith Morris leads Dow’s commitment to Building the Workforce of Tomorrow, driving strategy around the Global Citizenship priorities of empowering educators, getting students excited about pursuing STEM fields, and turning that excitement into successful career pathways. Meredith coordinates across public affairs, human resources, government affairs, R&D, Dow businesses, and an executive level STEM Council, to ensure the company is driving strategic global investments and creating meaningful partnerships. In addition, she leads the company’s STEM Ambassador program, where more than 3,000 employees across the globe engage in their communities with teachers, students, and key stakeholders to positively impact local education and workforce needs. Previously, Meredith held roles at Dow in Executive Communications in Midland, Michigan and Hong Kong for the Asia Pacific region. Before coming to Dow, Meredith spent four years at the Clinton Global Initiative in New York City. Prior to that, she worked for the French Embassy as an English Language Assistant Teacher in Rennes, France. Mr. Moser joined Brenntag in 1978 in Pittsburgh, PA. He served in a variety of positions including commercial management, supplier development and procurement, and regional management before taking on his current role as Brenntag’s Senior Vice President of Global Accounts. Mr. Moser also acts as Brenntag’s Director of Government Affairs for North America. Mr. Moser received a BS in Biology from the University of Connecticut and an MBA from the Katz School of Business at the University of Pittsburgh. He also graduated with advanced training in International Leadership from Ashridge College in the U.K.
Mr. Roop has worked for Horn (formerly E.T. Horn) for the past ten years. He has regulatory, quality and human resources oversight responsibility for all eight of Horn’s divisions. Prior to Horn, he spent six years with Firmenich in a global sourcing role. Mr. Roop’s background is in pharma, fragrance and flavor manufacturing, and his strengths include international strategic sourcing and domestic regulatory programs. Mr. Roop graduated with a B.A. in Business and a minor in International Business from California State, Fullerton. He has served as a volunteer for CEF’s You Be The Chemist Challenge program since 2007. After earning his Ph.D. in Chemistry in 1981 and serving a two-year postdoctoral appointment at the University of Massachusetts, Mr. Russo began his career at Louisiana State University. As the Land Grant (and Sea Grant) university of Louisiana, and one of the most diverse institutions in the United States, LSU is well situated to prepare a wide spectrum of students for careers in all disciplines, including Chemistry and Chemical Engineering. In 2013, Mr. Russo joined the Materials Science & Engineering and the Chemistry departments at the Georgia Institute of Technology, where he currently serves as a professor. Mr. Schechinger began his career with Stauffer Chemical in 1979 as a Sales Representative. He continued his career with Texasgulf and the LCI Chemicals in various sales and marketing positions. In 1998, Mr. Schechinger purchased REP Chemical and established BHS Marketing LLC (independent), a full line distributor with sales throughout North America and also into international markets. Vice President, Sales & Marketing, PVS-Nolwood Chemicals, Inc.
Mr. Temple was born and raised in Kenton, OH, where he incorporated his first business, Temple Enterprises LLC, at the age of 14, managing commercial, industrial, and residential properties throughout Hardin County. He received a BS in Business Administration with a minor in marketing from Ohio Northern University, and joined PVS Nolwood Chemicals, Inc. in 2003 as a sales representative covering Central and West Central Ohio. He was later promoted to the position of Ohio and Indiana Sales Manager. In 2010, Mr. Temple received an MBA from Ohio State University. Since January 2013, he has been responsible for all of PVS-Nolwood’s sales and marketing efforts. Mr. Temple is a member of the Michigan Chemistry Council, where he is also a member of the Board of Directors. Mr. Whitaker began working at Whitaker Oil Company in 1975 and has held numerous positions within the company, ranging from loading and driving trucks to managing operations and sales territories. Mr. Whitaker has been President of Whitaker Oil Company since 1986. A volunteer group of professional scientists, educators, and industry members who review CEF’s program content to ensure that it is accurate, educationally effective, and accessible for students. Members of the Content Development Team at CEF’s first-ever Content Development Conference in October 2016. Project Engineer, PVS Chemicals, Inc.
Help us pursue our mission of fostering a greater understanding of the science and value of chemistry. Enter your email below to stay in touch with CEF through our e-newsletter.